There are two players who control over half of the bean-based beverage market in the U.S. And, it wasn’t always so competitive between the two coffee chains. Both the brands co-existed when Dunkin’ Donuts hadn’t put much emphasis on the Dunkaccino and went head-to-head with Starbucks in 2006 with the ‘Fritalian’ ad. Starbucks never retaliated for the attack, but the competition between the two was clear enough. The long-brewing rivalry then entered a new domain – the digital marketing. 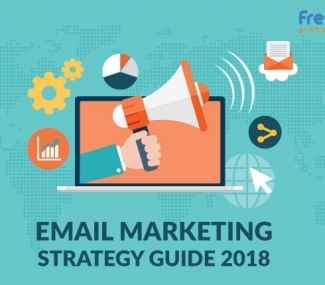 While both the companies continue to grow and profit, it remains unclear, which one is better at email marketing. It’d be interesting to see how these two coffee chains span out when it comes to their email marketing tactics. 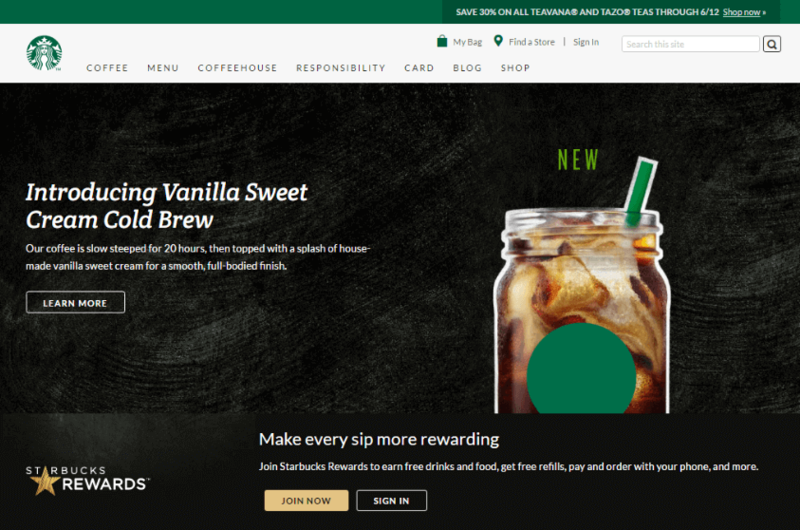 Starbucks: As soon as you enter the Starbucks homepage, you’re greeted by a popup at the bottom, asking you to sign up for their email list. It’s not too intrusive. Even if you accidently click x, you can still sign up for their emails from the ‘Join our email list’ at the bottom of the page. Immediately after the sign-up process, you’re relocated to a page which gives you three neat options: 1) Create a Starbucks account to manage Starbucks Cards and contact preferences, 2) Register a Starbucks Card, and 3) Download the Starbucks app for iPhone or Android. 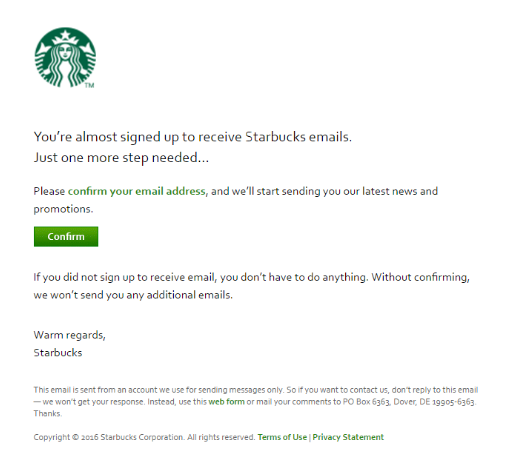 Starbucks: Immediately after completing the sign-up process Starbucks shoot a welcome email which also makes up as the double opt-in process. 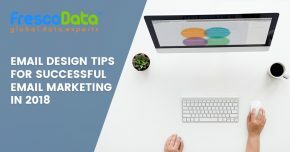 Starbucks stands out for one good reason: 1) The Double opt-in – Did you know that double opt-in lists have higher engagement levels over time and is considered a good email practice? The welcome email offers no great discount, no deals. Dunkin’ Donuts: ‘Welcome to the Dunkin’ Donuts® Shop! Save 10% on Your First Order’ reads the subject line of the welcome email. The email doesn’t have a great deal of visuals, does it? It’s mostly paragraphs, paired with striking colors. The email offers a special deal: Save 10% on first order. In addition, it includes a call-to-action to its online store. 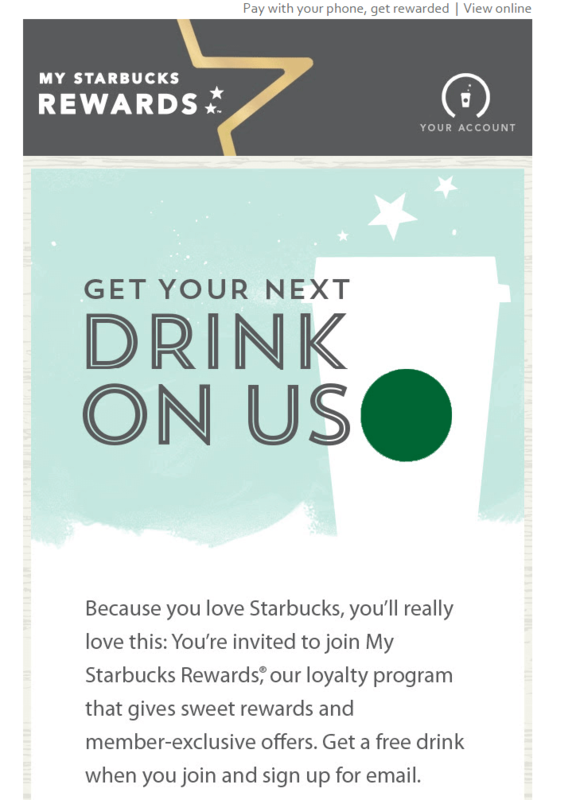 Starbucks: Starbucks sends the first promotional email 24 hours after the welcome email. There’s a lot going on in Starbucks’ email. It also chooses to talk about its special rewards loyalty program and its perks. Best of all, the email ends with a call to action where newbies can register for the loyalty program. 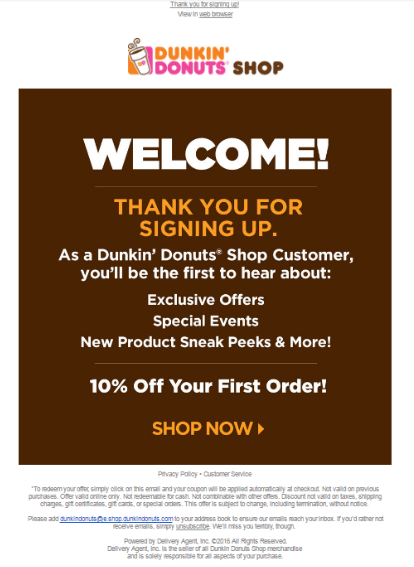 Dunkin’ Donuts: Unlike Starbucks, Dunkin’ Donuts sends email promotions on special occasions like Mother’s Day or Valentine’s Day. 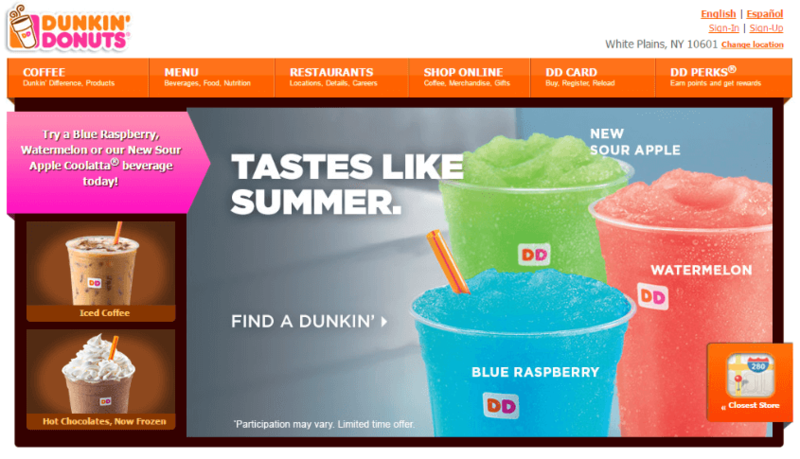 Email campaigns by this donut and coolatta chain are very few, with barely 12-15 filing up your inbox in twelve months. So, who’s the champion? 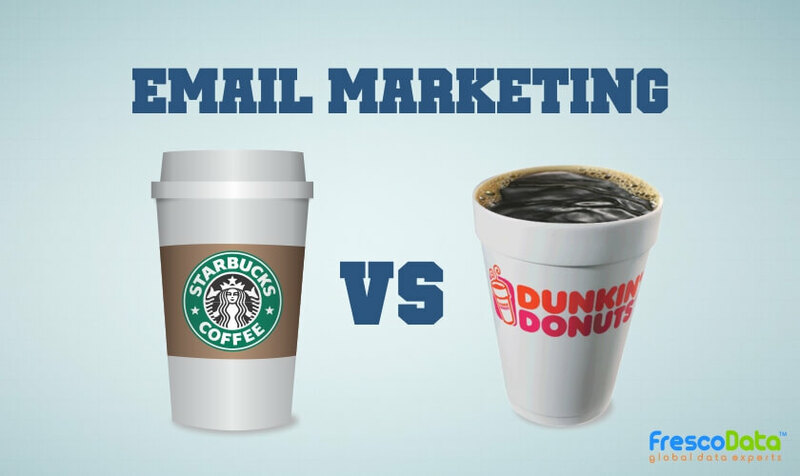 It’s a tough match, and honestly, we expected both the coffee chains to do some pretty solid email marketing. But it seems, lesser emails is the mojo these days. Although, we’ll have to give this one to Starbucks. 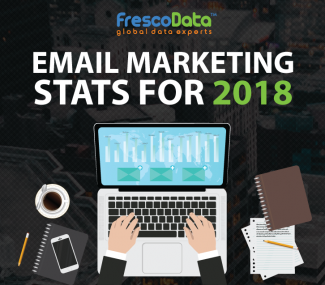 Even though it sends emails more often than Dunkin’ Donuts, they’re spam compliant, compelling, and include solid CTA links.